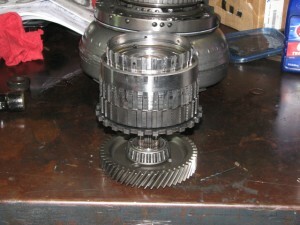 Chrysler TF 604 for Sale: Pic-Internal gear. The Chrysler transmissions named the TF A-604 or TF604 or 604 are way more technologically advanced and unique in their own right than one might expect for an affordable car. Especially since the majority of 604 automatic overdrive transmissions go in the less expensive and medium priced Chrysler, Dodge, and the now defunct Plymouth vehicles. The fully electronically computerized controls make this particular transmission so unique because of the type of controls, called adaptive controls, which actually reduce the overall complexity and size of this transmission. When you compare it to the older A-413 series 3 speed front wheel drive Chrysler transmissions, we find the size and weight remain almost exactly the same. In reality the unique design has about 20 less parts than the older 3 speed unit. And, it only weighs 13 pounds more. Considering you are getting an extra gear and a lock up torque converter, it is quite a unit. Let me list the cars that that Chrysler corporation uses it in: (with the 3.0L engine only) New Yorker, all Grand Caravan models, Spirit ES, Dynasty, Caravan LE, Dynasty, Acclaim LX and Pt Cruiser. Each vehicle uses a dedicated computer or TCU transmission control unit that is designed to operate the transmission in a manner to suit said vehicle. If you are looking for a replacement 604 for your car, remember that it is imperative that the company you choose identify the exact transmission in your car, using the vehicle identification number to supply you with the exact match. Another issue worthy of mention is buying a replacement TCU controller. Again, perfect identification is mandatory. Installing a computer on a car with a 604 that was designed for a different Chrysler product will often not allow the transmission to function correctly, if at all. By the way we have fully tested TCU on sale just for the purpose of supplying our transmission customers who discover the TCU is bad with an exact match product, with a better guarantee than a new one from the dealer. Regardless of your pursuit. Replacement transmissions or a TCU, are tested and packaged, we have an inventory ready to go for your convenience. Call one of our representatives and discuss which one of our products suits your needs and budget. GotTransmissions.com @ 866-320-1182.